QuestionDo sharks attack for food, fun, or revenge? Hopes&Fears answers questions with the help of experts. 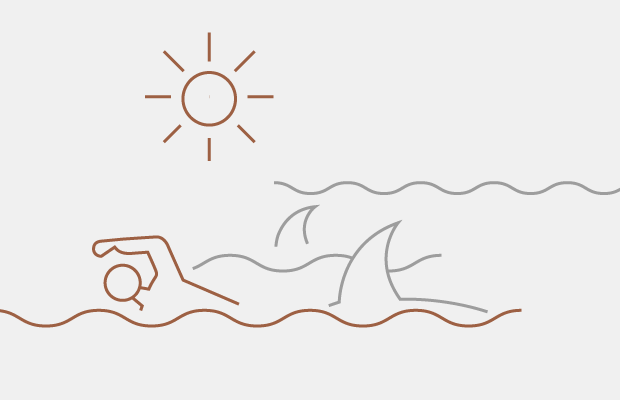 In the wake of a string of attacks off the Carolina coasts last week, we wonder why sharks are trying to chomp people. Happy Shark Week? Jaws cemented sharks as terrifying monsters with a taste for human blood in the 70s. But really, you're more likely to die from getting struck by lightning than a shark attack. Yet, media portrayal of sharks as man-eating apex predators is so popular that it’s hard to get people to care enough to help save them from extinction. So what’s the deal? Do sharks attack people for food, fun or revenge? We asked the shark experts. There is no species of shark that uses humans as a food source. ‘Fun’ and ‘revenge’ are human concepts, not shark concepts. So, you can rule out fun, food and revenge. The one minor wrinkle is that some sharks might attack when cornered, but that is very rare. Most shark attacks on humans can be explained as unfortunate examples of mistaken identity - meaning that the shark thought the human might be a normal food item until it found out otherwise. Food: Sharks have been around for 400 million years, long before humans ever existed. As a result humans are not imprinted in a shark’s brain as prey or a potential food source. Fun: Any animal that attempts to ‘attack’ another large animal risks getting injured itself and requires a strong motivation such as breeding rights, defense of its young, or territory. Such fights usually involve animals of the same species and are definitely not ‘fun’ for the animals involved. Revenge: No shark attacks a human for ‘revenge,’ but if threatened - like any animal, including humans - it will try to defend itself from injury or death. I have never observed play and can’t imagine that sharks could actually have fun or seek revenge, which are human passions. Professor of Marine Biology at California State University, Long Beach and Director of the CSULB Shark Lab. As a shark biologist, I have a hard time imagining sharks doing anything for ‘fun’ – at least in the way that we think of as fun. So, I greatly doubt that any shark would bite a human for such a purpose. As best as we know, sharks have a fairly simply brain, but it is by no means small. The part of the brain dedicated to thinking is relatively small in comparison to mammals and birds; however, they dedicate a lot of neural tissue to interpreting sensory information (smell, sight, hearing, etc), aiding them as predators of big, highly mobile prey. Like many of the lower vertebrates (e.g. bony fishes), sharks seem to work by simple rules – eat, grow, don’t get eaten, mate. They actually have the ability to learn quite quickly and can retain information for prolonged periods of time, which is how many can live to be more than 70 years old in an environment that can rapidly change. If sharks considered humans a viable food item, there wouldn’t be nearly as many people going to the water, and certainly fewer coming out. So clearly, sharks do not consider human part of their diet. Nonetheless, sharks do occasionally bite people; however, we’re not really sure as to why. Shark biologists divide shark-related interactions with humans into two general categories: provoked and unprovoked. The provoked incidents are pretty easy to explain. The person catches, grabs, hugs, chases or taunts the shark, and the shark merely defends itself just like any animal would. The unprovoked incidents are a little more difficult to explain, but motivations could be broken into two general categories: feeding or defense. One possibility is that they mistake people as one of their normal food items, but then decide after biting someone that they aren’t worth actually consuming. Why that is, we’re just not sure. If a shark was starving and mistook a human for a seal or turtle, why won’t they eat the person? We’re still made of proteins, fats and carbohydrates. Maybe we taste bad, don’t taste fishy enough, or simply aren’t fatty enough. Either way, for most of the people who are bitten there is seldom evidence of flesh consumed. Another possibility is that a shark may bite someone because they consider them a threat. Sharks are no different from any other animal, in that they will defend themselves if they are attacked or threatened. So, people may be bitten because the shark feels the person is in their space and thus pose a threat. The person may not even know the shark is there. In most cases, the person who is bitten usually leaves the area (typically as fast as they can), and the threat goes away, so the shark does not pursue. This may also explain why some people are only bitten and not consumed. Some sharks are known to be a bit more cantankerous than others. For instance, I have seen large bull sharks that were caught and tagged along the side of a boat, come back and bite the boat AFTER being released. While it might be hard to call that vengeful, that certainly shows a “don’t screw with me” kind of attitude generally not seen in other species. Tiger and white sharks, despite their “badass” reputation are actually big pussycats when it comes to being caught and tagged. The world saw only three known shark-attack fatalities in 2014. The last fatal shark attack in South Carolina was in 1852. While the answer might seem obvious, the ‘obvious’ answer is actually different for many people. From a scientific standpoint, the bottom line is that unprovoked attacks by sharks upon humans are extremely rare accidents with an annual average of about 6 human fatalities a year. In contrast, humans kill an extremely large number of sharks every year through the shark-fin trade and as by-catch (unintended capture while fishing for other species). Some estimates put the shark death toll as high as 150 million sharks per year. Despite these facts, what many shark scientists are realizing is that when talking to the public, it’s not cold facts that stay in people’s memories, but stories. Hence some people's misinterpretation of why sharks attack. The success of fictionalized pieces like Jaws or the Sharknado Trilogy is understandable because people love a good scare with a villain to punish. Unfortunately, too many people confuse these movie sharks with real shark behavior so for many the reason why sharks attack humans may seem obvious and sinister. However, this just isn't the case. Sharks do not attack people for fun or for revenge, therefore we cannot treat sharks like we would a human villain committing a crime. In other words, there is no one to punish. That's not say we haven't tried. Hawaii "punished" sharks by killing them for coming too close to shore for nearly 20 years, yet their efforts did not minimize the risk to people; they were only successful in killing over 4,000 sharks. Memorable and tragic shark attacks in Australia prompted the government to seek a similar and very controversial "solution." Unprovoked attacks are almost always a case of mistaking people for food (I say almost always, since I personally have not analyzed every shark attack.) 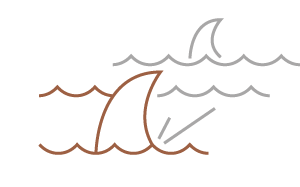 Unprovoked shark attacks - which are often not considered "true attacks" - stem from the shark trying to protect itself from a perceived threat, such as a fisherman that has hooked the shark, or an aquarium diver bumping into one by accident as they work in the same tank. Another phenomenon that has arisen in recent years are unprovoked shark attack hot spots that previously weren't high risk zones for shark-human interactions. Scientists are still trying to understand this, but humans may actually be the cause for this! In Recife, Brazil, development along coastlines is believed to have caused local sharks to move their hunting grounds over to a popular beach for humans. [Ed note: The development got in the way of a coastal estuary, which was a main migratory route for sharks.] What is more intriguing about this story is that Recife not only found a 97% effective solution, but their approach of re-locating sharks offshore avoids killing large quantities of sharks. Tiger sharkS are scavengers with a "nearly limitless menu of diet items." They eat sea turtles, clams, stingrays, sea snakes, seals, birds, squids, and even license plates and old tires. The Great white shark is "the world's largest predatory fish." They eat sea lions, seals, small toothed whales, sea turtles and carrion. The thresher shark eats northern anchovy, Pacific sardine, Pacific mackerel, California barracuda, Pacific hake, pelagic red crab, louvar, grunion, jack mackerel, shortbelly rockfish, market squid, and euphausiids.